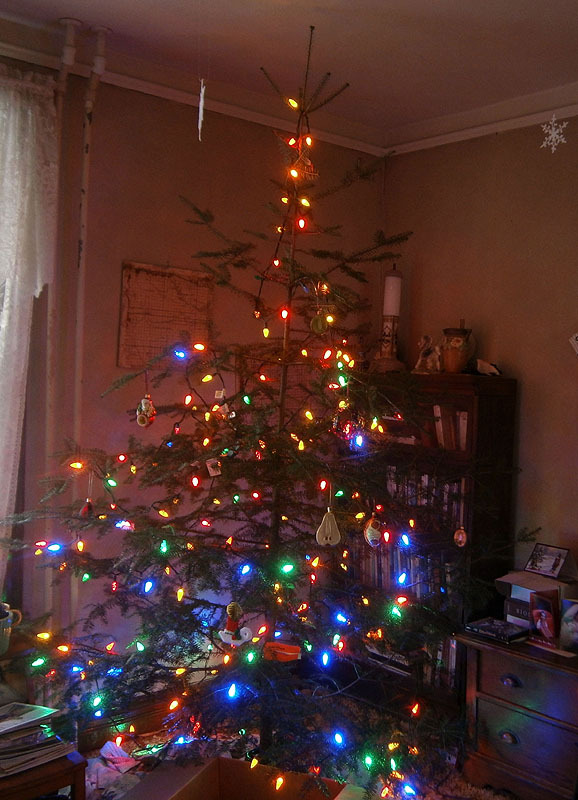 We got a permit to harvest a Christmas tree from Superior National Forest, so we drove up to Isabella, MN, and cut down a beauty. 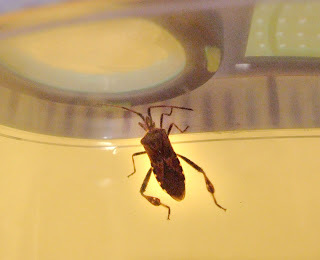 About a week later I found a bug in the house, not exactly a very common occurrence in December in Duluth, so I captured him and looked him up: a Western Conifer Seed Bug. I'm guessing he must've come in with the tree. According to my book, they eat the needles and green cones of conifer trees, so I've been keeping him in a 6" x 8" x 10" plastic bug habitat with various pine or spruce twigs that I change every couple weeks. I haven't seen any evidence that he's actually eating them (there's been no poop on the floor of the habitat) but he is still alive and seemingly healthy, about two months later. I frequently see him navigating the twigs or scaling the sides or ceiling of his habitat, and last time I changed the greens he flew out and I had to recapture him. (I had seen him clean his wings before, but had never seen him fly before that. It was a brief, buzzy, grasshoppery flight of about two feet from the habitat to the windowsill.) If he survives the winter I'll let him go outside once the weather warms up, and might even release where we found him. It would be a good excuse to drive out to Isabella again. At first I thought you had a leaf-footed bug! I actually do! Western Conifer Seed Bugs are a type of leaf-footed bug. Or at least, I did have one. This morning I found him dead in his habitat.